I’ve been retired a year-and-a half now and I can tell you that the first year wasn’t easy. Fortunately, I had prepared for my career to end, mentally and financially. But my body was so used to the routine that in June and July, training camp months, I would just wake early and look at my clock and it was 5 a.m. And I would sit there and reminisce about some of the things that I had done, things I knew other guys were doing, because I had been doing it since the age of 7. It wasn’t easy sitting on the couch watching games and seeing guys that I had competed against for so many years continue to play the game. It makes you question yourself and think “Why am I not still playing? Did I not put enough work in?” It’s just those questions that we all have who played the game and left the game, and we have to deal with. We all know that the last game is going to come to an end and the last whistle is going to blow on our career. We all deal with it differently. I’ve always planned for the future and I always took advantage of my veterans in the game, the older players I played with. I’ve kept in contact guys like Isaac Bruce, Torry Holt, and Muhsin Muhammad. Those guys were 8-10 years older than me and I would always lean on them, even when their careers were over and I was still in the middle I would check in and ask them how the process was. Leaning on those guys certainly helped me understand how to shorten that period of time of uncertainty between my playing career and my post-playing career. I’m glad I did that. I put many stones in the fire and continue to have many stones in the fire, which has kept me busy. But I can tell you at times, I still find myself looking for that competitive edge, missing the chance to compete. Fortunately, I’ve been given the opportunity to reconnect with some of my fellow players and help bridge that gap from playing, into a post-playing career for others as well. 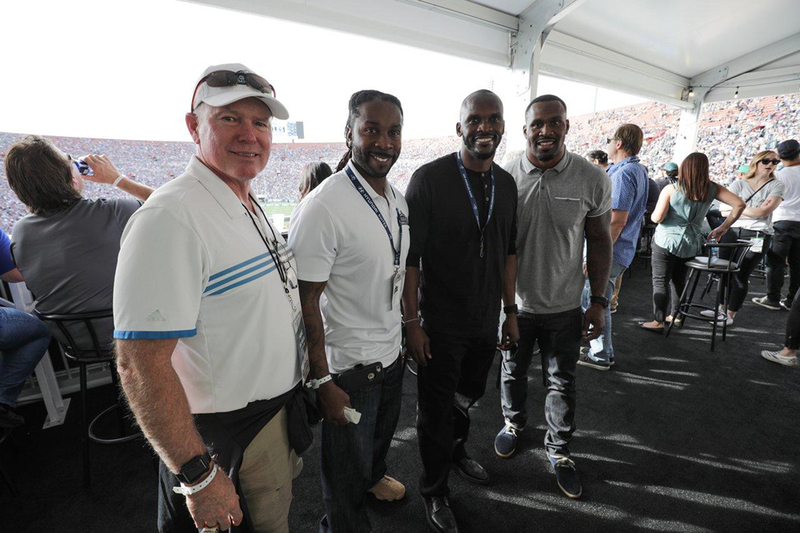 I recently took a role with the National Football League, as the Pacific-West coordinator of the NFL Legends Community. This opportunity came about for me after I asked for a meeting with the Commissioner this past summer. I was pitching an idea for the Las Vegas community as we gear up to welcome the Raiders to the area in a couple of years. With that meeting, I believe that I got on the radar of some people with the NFL and shortly thereafter they came to me with this opportunity, knowing that I was unique position because there are not a lot of former players that know the Las Vegas community the way I do and know the NFL the way that I do. It just made sense on paper and they wanted to know if I was willing to help out as we anticipate the Raiders arriving here in Las Vegas. It was one of those things where, once we met with one another, we realized where I was headed in my post-playing career and the things I wanted to accomplish and seeing that this was an opportunity that was very unique. It just seemed meant to be. I don’t even know if you could put odds and me being ready to take that next step in my post-playing career and just this perfect opportunity with the league being right there for me. Essentially, what my job is, is to help guys on the West Coast understand, not only their benefits and some of the perks that we get. But also maintaining a brotherhood and a sense of the camaraderie that we’ve all grown up with. The majority of us have played this sport since we were children and once you transition to retirement, it can be very isolating and very lonely. 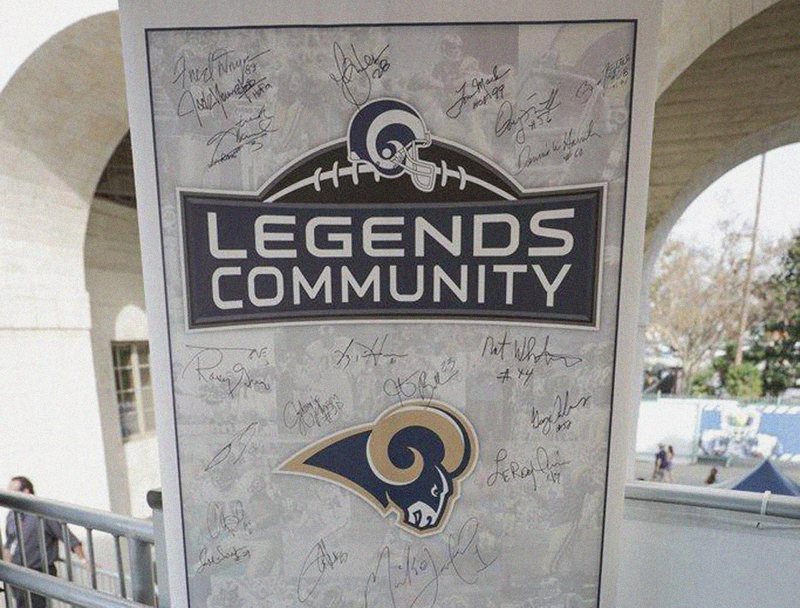 So what we’re trying to do in the NFL Legends Community is make sure that guys who have played at least one year in the NFL know that they can come back to the NFL Legends Community and have a sense of the collective and feel like they’re still involved. The reason that we named it the NFL Legends Community is because only 20,000 men have played in the NFL over its 98-year history. Of those 20,000 guys, more than 13,000 have played two years or more. With those kind of statistics, we feel that we are the one percent of any community we come from, so whether you’re a guy from rural Iowa or a guy from the inner-city, you are one of the few that actually made it out of that community, and you are a legend in your community that you come from. It’s a hard feat to achieve to even be on a NFL roster. So we want guys to know that you don’t have to be a Hall of Famer or an All-Pro to reap some of the benefits of the hard work and dedication that you put in to even be able to play on Sundays. I have a great group of guys with me out West taking care of the different regions here. Mack Strong, who played 14 seasons in the league as a fullback with the Seattle Seahawks handles the Pacific Northwest. Donnie Edwards, who played 13 seasons at linebacker for the Chiefs and Chargers, handles Southern California. Kwamie Lassiter, who played 10 seasons at defensive back for the Cardinals, Chargers and Rams, takes care of Phoenix and Arizona. And of course, I’m handling my home, the Las Vegas area. 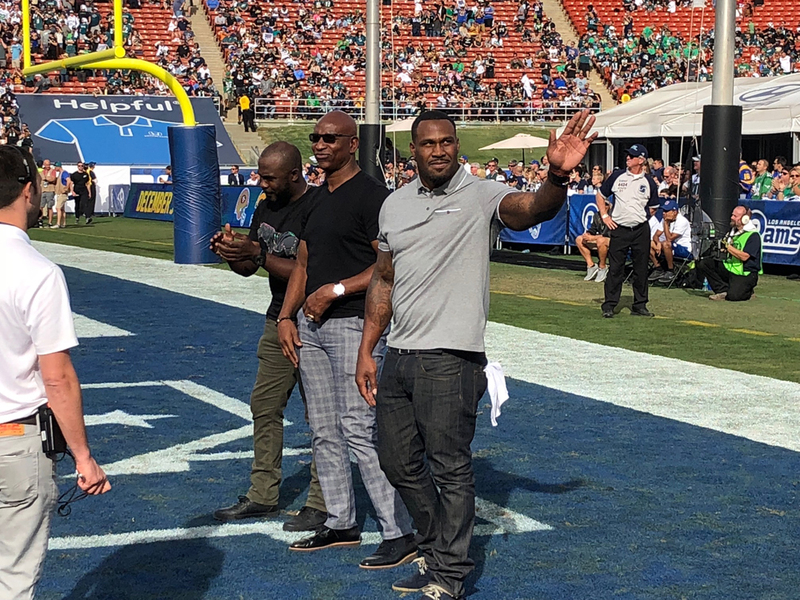 Last week we staged a great event at the Los Angeles Rams and Philadelphia Eagles game, where we hosted, for the first time since the NFL Legends Community was formed, retired players from both teams, the Rams and Eagles, in a suite. It gave us the opportunity to talk to some of those former players about what we are trying to do in the NFL Legends Community and making sure that they understand their benefits and how we’re trying to bring everybody back together and build that camaraderie. So we wanted them to know that there’s help to be had and try to get ahead of some of the things that we all feel are hard to talk about and feel that no one really cares or can understand. Having someone like myself or a Donnie Edwards, who was a teammate of yours 10-15 years ago, to reconnect and not only talk about the successes but also the some of the vulnerability that you may have felt or still feel, it just allows guys to get that locker room feeling that very few people in their life understand. I’m really proud of that event and how everything turned out. One of the best parts was that it wasn’t just the retired players we had there, we also invited their families to join them. We wanted all of them to understand that their families are welcome at our events because, for many of us, once we walk away from the football field, it is our spouses and our family members that tend to have to deal with the emotional rollercoaster a guy goes on once he decides to leave the game, especially for those who didn’t decide to leave the game of their own will. So it’s important to us to keep those family members connected as well. Everybody who has played in the NFL has a story. We’ve all seen the 30-for-30’s and the Football Life documentaries that the NFL does a great job with. We’ve seen how these guys go on to have second and third careers after their NFL playing days are over. And we in the NFL Legends Community think it’s important to highlight those post-playing career successes that guys have, and offer to help support those guys in any way possible, especially in the communities where we have a voice. 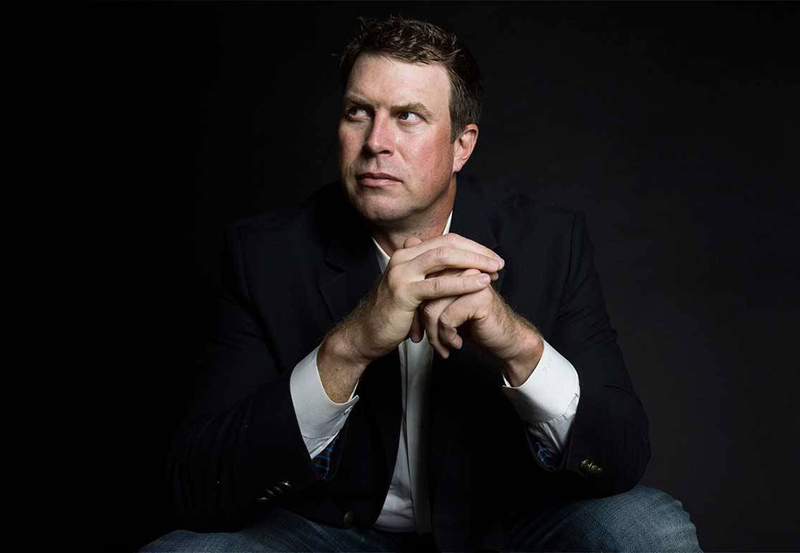 One of the more inspiring stories I’ve heard is the story of Ryan Leaf. Here’s a guy that was decorated coming into the league, the No. 2 overall pick, but had a tumultuous career in the sense of where he was drafted and the way things panned out for him. Once his playing career was over, he was incarcerated for a while, dealt with substance abuse and hit a low point. But he was able to come out of that and now he works with others who are trying to recover and also does a lot of motivational speaking, talking about his hardship and overcoming those things. I met with him and a few other former players not too long ago and hearing his story was really inspiring to me. It was really refreshing to hear him talk about it and really just made me take a step back and look at life a little differently. What made it really hit home was the fact that he was so grateful to be in the presence of myself and some of the other guys in the room, and that was very humbling because I remember being a high school kid watching him get drafted into the NFL. It was just one of those things in life that makes you realize someone else has always had to endure and overcome more. It puts things in perspective. I was also inspired when I got a chance to catch up with Justin Tuck recently, to hear that he is in the process of getting his MBA from Wharton. His post-career story isn’t completely written yet, but he’s making great strides. These are stories that have not been broadcast loud enough through the microphone. It’s been amazing. Another part that’s been surreal to me is just connecting with some of the legends of the game. This past fall I got the chance to sit down with Joe Montana and Ronnie Lott, two guys I grew up watching them play and who I idolized. To be able to talk to them, not only about the Legends Community, but the transition: lessons that they learned, pitfalls to avoid and skills they adopted, and about their post-career success, what they have going on and how I could possibly work with them, was so humbling. It’s one of those things where, not only am I trying to help guys understand the benefits that we have, I’m getting a chance to network and meet people that I idolize and that I’ve watched from afar. It’s more than I possibly could’ve asked for when my playing career ended. 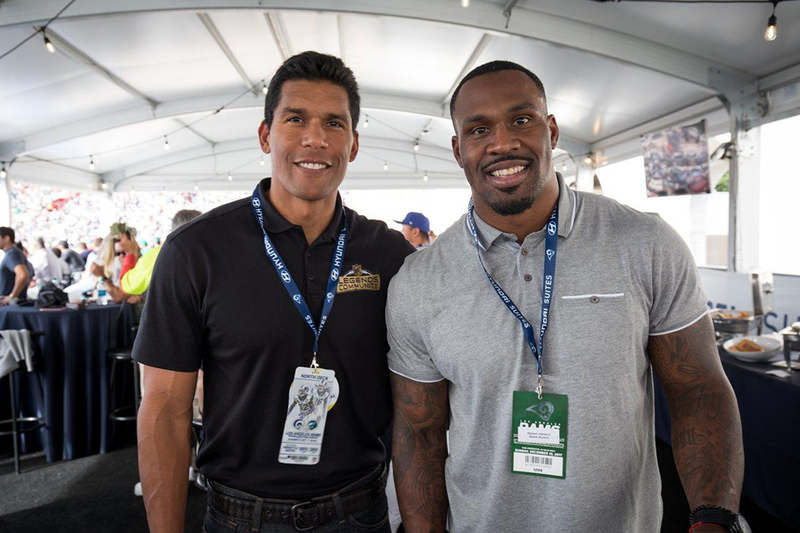 The NFL Legends Community is still growing and we know that we’re not necessarily going to get it all right out of the gate, but we’ve pledged to continue to get better at it, continue to hear guys out and see what we need to do to help guys to help guys get across that bridge from retirement into a second career. Congratulations on your next step, Steven!!! The leadership in the NFL was wise to reel you in! You’ll make a huge contribution to the work you are undertaking! I think you will find it rewarding, as well. Retirement can be hard but it opens up so many new ways to look at life! It’s all about maturity and making good choices. I feel you have grown and made good choices as well. I would love to see your Legends Community embrace the current players and mentor them on conduct and just being good humans playing the game. I believe integrity is a learned skill and should be a part of everyone’s growth. Please encourage your Community to continue to give to the Cities they played in and keep the connection strong. I feel St. Louis has been left in the dust since the departure of the Rams, It would be great to give those folks a reason to cheer and rally behind something again. Your time playing is so short in comparison with the rest of your life. Keep engaging in the public and making yourself available. Steven- so encouraged by your next career choice! You’re still an inspiration. I’ve been a fa since watching you at Oregon State. Great to hear the transition period is being addressed by the NFL as well. I can’t wait to see what comes from this. Congratulations my brother! This sounds like a great opportunity and position for you! Your leadership skills and strong work ethic will serve you well here too! We miss you in St. Louis SJ39!!! Good luck on your new role!! !